The Grecian is steeped in history. One of London’s early Coffee Houses, it counted Isaac Newton and Edmond Halley among its regulars. 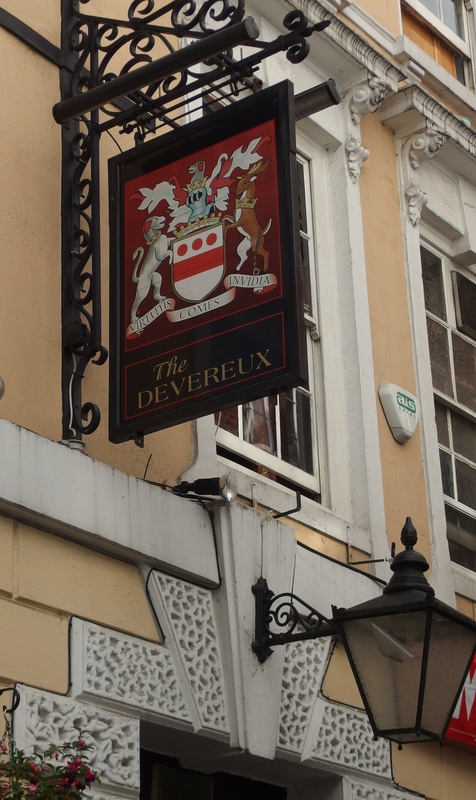 Today it is the site of a pub, “The Devereux“, owned by Taylor-Walker. The building itself dates from the nineteenth century though it is on the site of the old Grecian (a drawing of which can be seen on a wall inside the pub). In a sense, the Devereux is a continuation of the Grecian that once existed on this spot and it is for this reason that I’ve wanted to enjoy a drink at the Devereux/Grecian for a long time. What better time to do it than for a Christmas themed cafe-physics review? 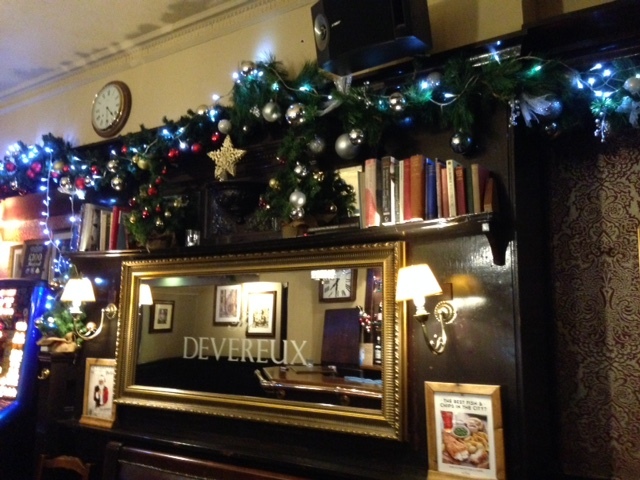 The Devereux itself is a fairly spacious, comfortable pub, tucked down a little alley just off Fleet Street. It is strange to consider (while sipping on a glass of the 1730 pale ale) that it was here, just over 300 years ago, that the Grecian would host the after-meeting “pub outing” of the (then newly formed) Royal Society. Paintings and photographs of the Grecian and the Fleet St. area surround you, as you sit and enjoy your drink (they do serve tea and coffee too). Indeed, it is possible to almost feel the history of this place. I recalled reading a 1686 paper in the Philosophical Transactions by Edmund Halley in which he described a live demonstration, in front of a meeting of the Royal Society, of just how much water could evaporate from a heated plate of water in two hours. Halley was interested in this as part of the whole question of how rivers formed and where rain came from. I wondered whether Halley and his friends Newton and Sloane, retired to the Grecian after that meeting and sipped on hot coffee as they sat next to the cold windows which started to steam up on the inside. Reading about these early frequenters of this drinking establishment, it is hard to avoid the impression that they were driven by an interest in knowledge and knowing things. Of course the term ‘scientist’ had not yet been invented*. Science as in ‘scientia’ was still just Latin for knowledge, the men who gathered at the Grecian (and they were mostly men) were not “scientists” they were Natural Philosophers. Hans Sloane, another regular, was a great collector, finding curiosities from around the world and displaying them in his house. Most of his collection became the start of the British Museum but there is one curiosity of Sloane’s that I came across recently that is not to be found there at all and that is his “Vegetable Lamb”. Vegetable Lambs were believed, in the seventeenth century to be, genuinely, part vegetable part animal. You can see from the photo that they do look fairly animal-like. 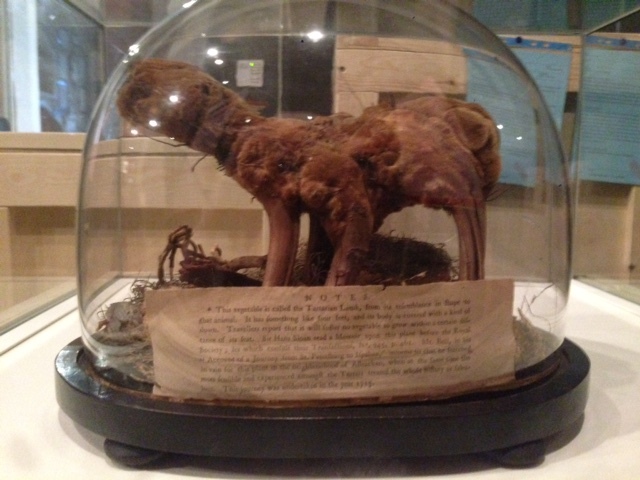 According to the Garden Museum, these vegetable lambs originated in the Far East but now only two remain in the UK. The one that belonged to Hans Sloane (which is in the Natural History Museum) and the one that belonged to John Tradescant and that can now be found in the Garden Museum (now sadly closed until refurbishment is complete in 2017). Hans Sloane’s contribution was to show that this vege-animal was in fact purely a plant, a type of fern, which may make vegetarians everywhere breathe a sigh of relief. It was because these people were interested that they worked so hard in trying to understand the world around them. Which brings us, somewhat surprisingly, to one of the more recent famous patrons of what had by that time become, the Devereux. It sometimes seems hard for us to sit in a cafe on our own without using, or at least looking at, our telephones. Checking our email or the latest news on our telephones has become extraordinarily ordinary for us. Maybe this should be our New Year’s resolution: put our phone back into our pocket and consider, with Chesterton, Sloane, Halley and Newton, just how wonderful it is. * The word science/scientist was first used in the sense that we now understand it by William Whewell in the nineteenth century.